Hi! Welcome back! 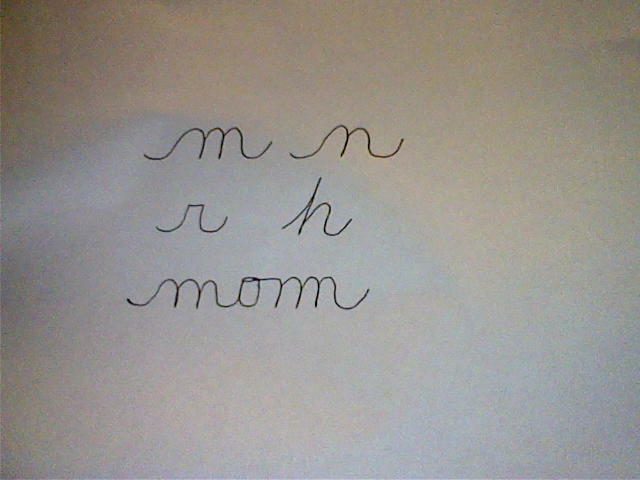 I hope you have been looking closer at your m’s, n’s and h’s and even your r’s. In my last blog I described the methodical/cumulative thinker. Today let’s look at several other thinking patterns: investigative thinker, analytical thinker, exploratory thinker and the keen comprehensive thinker. Don’t be surprised if you have two or more ways of thinking. As for me, I seem to be always investigating facts, and then analyzing everything. So I find myself always thinking, thinking,thinking! Eeek! It can drive you crazy-ha! Sometimes it would be nice if I could just gather known info, and leave it at that. Instead I have to investigate something for myself (not that I don’t believe you-it’s just my nature),and if that wasn’t enough I start breaking down the info till I have picked it to death! ha! Sound like you? If so, you have the inverted “v” format in letters like the m and n. This indicates an investigative mind. You have to search, and probe for facts, wanting to find out things for yourself! If someone tells you something is blue, you will look closer-investigating to see if it really is blue. If you also see a “v” format, you are an analytical thinker. You will go a step further, and take info you have gained, and sift, weigh, and really evaluate it’s worth. Breaking down, and analyzing what you have found. Do you like to search out info in the unknown? Things that are very far from everyday occurrences? Perhaps you are an exploratory thinker! Does it seem like you can pick up info out of the air? Do you have a fast mind? Does thinking seem effortless? Can you size up a room full of people rather quickly? Someone may be trying to explain something to you, and you feel like you have already “got it”. Then you may be a keen comprehensive thinker. This is shown by the needle-like points seen mostly in the m and n’s. The down fall in this type of thinking, are impressions that are too quick, resulting in quick judgements. Other mental processes are needed to evaluate info picked up this quick. In the diagram above you see examples of the different thinking patterns. No. 1 shows our investigative thinker with some analytical ability. No. 2 has exploratory thinking. No. 3 shows a methodical thinker and if we were to add some “v” formations we would have a writer that will build there facts one by one and then analyze what he has found. No. 4 shows our keen comprehensive writer picking up info rather quickly, but with some investigative inverted “v”s we see he will check on this info a little further, even analyzing some facts (“v” formation). In the word “Germany” we see a pointed “r” (keen comprehension) and some methodical/cumulative “m”s. He will pick up fast on some info while accumulating others. How about no. 5, he likes to explore! Try bringing him down to earth! Soooooo, what methods of thinking do you employ? How do you attempt to solve a problem? What is your dominate thinking patterns? Now, do you see how people could misunderstand each other, and have problems communicating? Just think…thinking patterns are only one part of our overall personality! So, remember this; the methodical/cumulative thinker will seem slow, and boring to someone with faster thinking like the keen comprehensive thinker, but be patient. Our methodical/cumulative thinker just wants facts, not the analytical thinkers break-down of everything! My husband will ask me about something, and before he knows it, he will get more info than he needs. Perhaps you see these differences in your relationships. Please don’t feel like the investigative thinker doesn’t believe you if he wants to dig a little deeper for info. Be patient with the very analytical thinker, you may need their analytical ability one day. Be glad the keen comprehensive thinker can understand your jabber with hardly any effort. Oh, and don’t forget the exploratory thinker who may be your preacher or an astronaut! So, think happy thoughts! Have a good day, and write me if you have any questions. Don’t forget the One who has the highest thinking of all! Our Father, Lord and Savior! Hi! Welcome back to my blog You will notice I didn’t ask “What” are you thinking, but “How”? In my last blog I left you with some m’s, n’s and r’s to look at. Did you see any that are common place in your writing? Well….get your pen and paper ready to write, and let’s see what methods you use to think,and how you attempt to solve a problem! Did you feel yourself slowly building one hump at a time? Now, write the word ‘name’ the way you usually write. 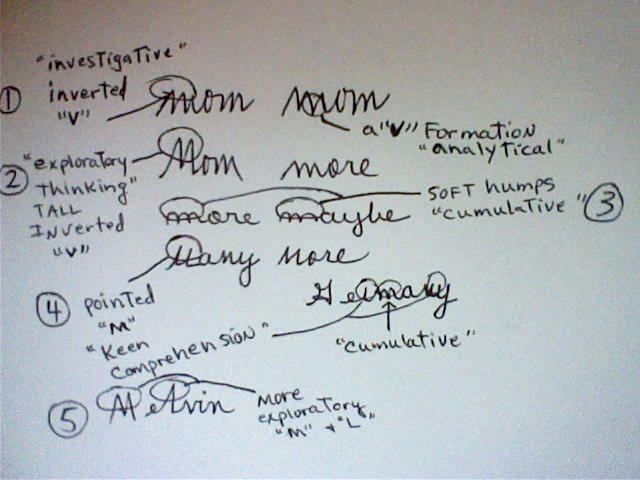 If you have more of the ’rounded’ humps in your handwriting, we say you are a ‘cumulative/methodical thinker. You slowly, but surely think by building one known fact upon another to reach a conclusion. You may be good at building or making things. You will notice this is a slower way of writing (thinking), which is why the ‘methodical’ thinker is often misunderstood. He may be viewed as “slow”. But, this person’s slow conclusions are usually right. A flat-topped ‘r’ indicates skill in using hands and feet. He’s creative. 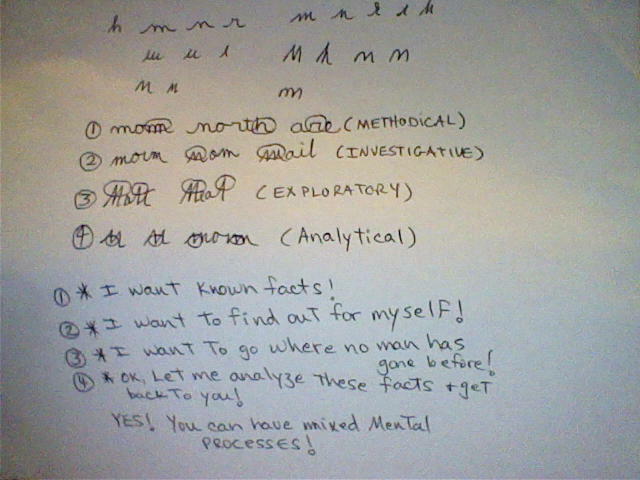 You may be ‘thinking’….” I have more pointed m’s and n’s.” Or maybe you have ‘v’ or inverted ‘v”s in your m’s, n’s, and h’s. If so, take a look at the diagram below. The first one we have already talked about. The ‘cumulative/methodical’ thinker. Match # 1 with # 1 and it says “I want known facts!”. Match the others to get an idea of what they mean. In part two, we will take a look at these other mental processes. In the mean time…..look at your friend, family or coworkers m’s,n’s, and h’s, even r’s.